At least one traditionally delivered financial service will be replaced by technology soon, according to new consumer research at ParameterInsights. The question is which one? Among the services reviewed by consumers in our recent study were investment management, financial, retirement and tax planning, and insurance advice—all of which have been targeted by so-called FinTech firms that largely deliver services over the Internet. While North American consumers were divided on which service would become obsolete, more than 60% agreed that at least one would be replaced within the next five years. The murkiness on which service area will be replaced reflects a general lack of understanding about wealth management concepts and a concurrent resistance to engage in any digitally delivered service option. In both Canada and the US, our research indicates this knowledge gap permeates all income levels and doesn’t taper with increasing income. 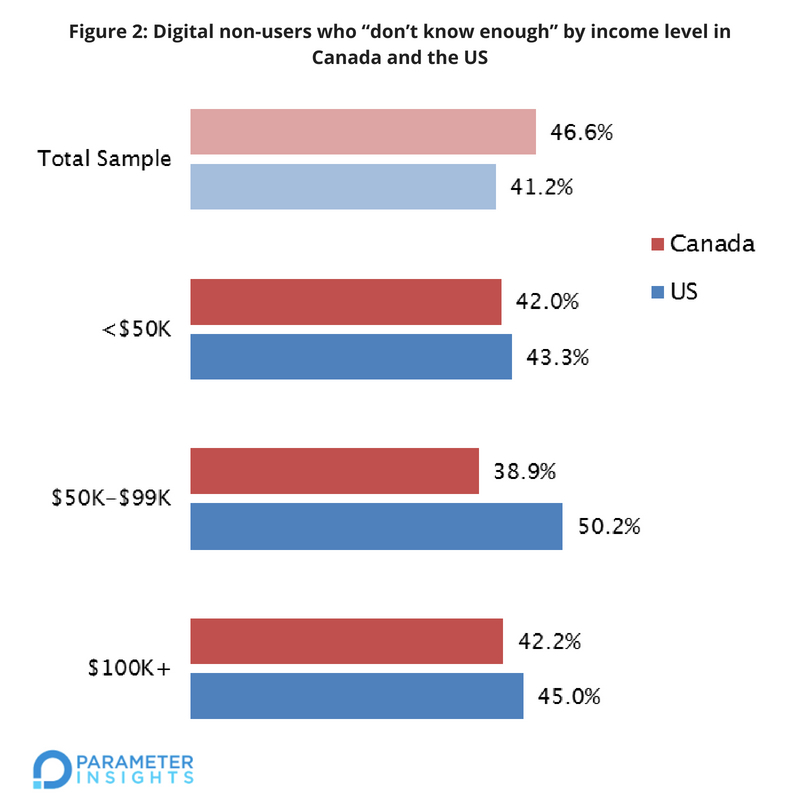 The chart below shows that digital non-users in the highest income bracket are just as unclear as those in the lowest income bracket. The implications are clear—as firms continue to replace traditional approaches with newer and more innovative digital offers, they must be relentless in helping consumers understand the significant opportunities now available. Marketing messages must go beyond basic product benefits (e.g., low fees) and focus on consumer education. Innovative customer engagement and acquisition strategies are also keys to winning the day. As this recent survey indicates, the proverbial writing is on the wall for an evolved wealth management industry. The question now is which brand will be the one to step forward to best engage the consumer and show why their product and brand experience will be the one that changes the industry. To learn more about our data and research into the digital wealth management category, please start a conversation with us at www.parameterinsights.com/fintechresearch.